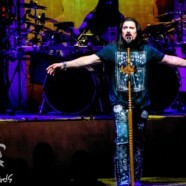 Dream Theater have announced details of the U.K. leg of their monumental European headline tour. The trek, which gets underway January 30th in Rome, visits the U.K. between April 18th-23rd, 2017, and will see the pioneering group celebrating the 25th anniversary of their milestone gold-certified album, “Images & Words”. Each performance will see the iconic progressive rock band delivering an unparalleled live set of “Images & Words” in its entirety along with fan favourites from their renowned catalogue.